DYN 2880 is a boutique producer run by husband wife John and Betsy Hartnett. Their first commercial vintage dates from 2006 – a grand total of 13 cases. Production has expanded considerably since then – today they produce about 600 cases of three wines. 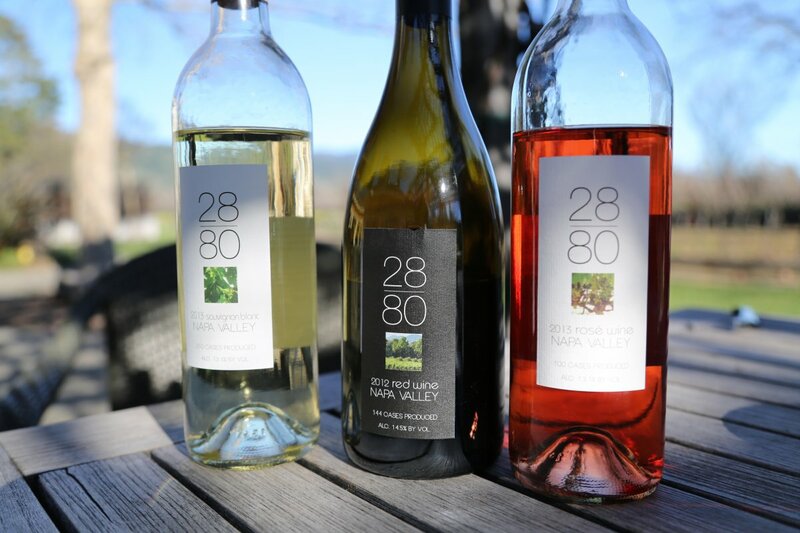 The first vines were planted on the property in 2001 (on a site not previously planted to vines)- unlike most small producers who either plant or source a Cabernet Sauvignon, DYN 2880 does neither. Rather at the time, they planted their 1/3 of an acre to Grenache, Petite Sirah and Syrah. Each vintage varies slightly but this tiny vineyard usually produces between two and three barrels of wine. They refer to their vineyard as the “backyard vineyard” and for good reason. It is planted directly behind their home in Calistoga. And it is a small enough vineyard that when harvest comes they can hand pick every vine themselves with a few friends in just a few hours. Calistoga has a reputation for being among the warmest parts of the valley and rightly so, but there are small microclimates within this sub appellation. Their property is on the valley floor – on the west of side of the valley almost in the shadow of the nearby Mayacamas mountains. Over the the years they have noticed this site is generally cooler than other parts of Calistoga. John has been involved in the wine industry for 30+ years. He owned a wine retail shop in New York – then moved to Florida and opened another wine shop in Sarasota. He also helped start a wine distribution company; through these businesses he was able to visit the Napa Valley many times and over the years he fell in love with Calistoga – its community and down to earth feel. He and Betsy would take vacations in France – ultimately they decided to vacation in the Napa Valley (closer and less pricy than trips to France). He and Betsy purchased a house here in 2001 and now roughly divide their time between Calistoga and Florida. John was introduced to Grenache during numerous trips to France. Through his retail business he was introduced to vintner Greg Brown, the founder of T Vine Cellars and both became friends. It was Greg who encouraged John to plant Grenache here on the property. 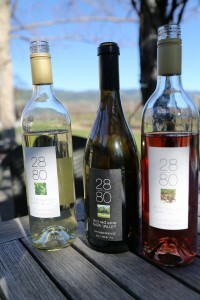 The 2013 Sauvignon Blanc is their most produced wine at 350 cases. This wine saw no oak during fermentation or aging. The bouquet is inviting showing aromas of melon, citrus blossom and guava. The palate is clean and crisp with some weight but little viscosity. The palate has notes of citrus without being ‘grassy’. Notes of lemon lime linger on the finish. This is a clean and balanced wine. The inspiration for creating a rosé dates back to 1988 when the family first traveled to Provence. They were introduced to this wine on a hot summer afternoon at a small bistro after the family had been driving country roads in search of Montbrun les Bains, a small village in South Eastern France. The 2013 rosé is made from juice that is bled/pressed off from the Syrah grapes that are in part used to make their red wine – this is a rosé of Syrah with small amounts of Petite Sirah and Grenache. It is dark salmon in the glass and shows fresh aromas of strawberry and raspberry on the bouquet. This is not a light rosé – it has good flavor and a pleasant finish that lingers surprisingly long for this style of wine. The 2012 Red Wine is a field blend of their three backyard vineyard varietals and additional Petite Sirah from the historical Pocai Vineyard – also in Calistoga. Each varietal contributes something unique to this wine – the Petite Sirah for the color and structure, density from the Syrah and the brightness and acidity from the Grenache. The bouquet is all about the fruit, appealing aromas – showing more dark fruit than red along with just a hint of white pepper. The bouquet continues to evolve after it continues to breathe – showing nuances of brown chocolate and a briar component – blackberry. It is a balanced wine easy to drink by itself or with food. Good acidity. Early showing tannins start on the front of the palate, are well integrated and linger softly on the finish. The name of their wine has multiple meanings. Their address is 2880 Highway 29 in Calistoga – upon Googling this number they saw it is coincidentally the number of minutes in a 48 hour period. Upon further thought they realized this was the length of time it took for John to realize he didn’t want his second date with Betsy to end. The DYN comes from CBD, a 1968 children’s book written and illustrated by the prolific cartoonist William Steig where letters are sounded out – so they created DYN which when pronounced sounds something like “dee wine”.